There are many outstanding project management tools. The ability of access, contribute to, and manage data while away from the desk is important. This review took a look at related products for iOS. 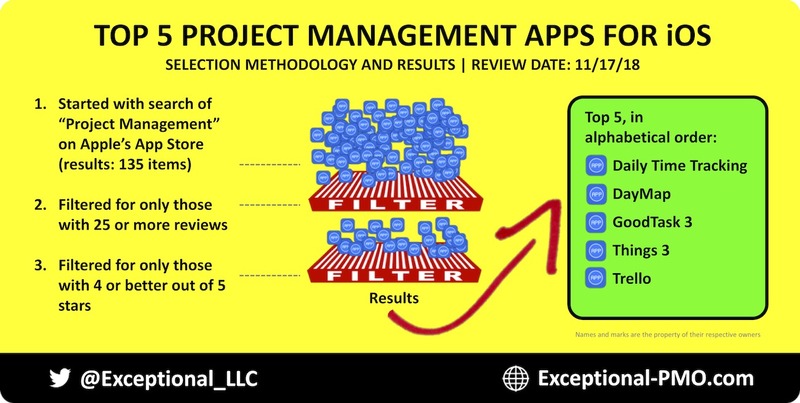 The selection criteria started with a search of "project management" solutions (paid or free) on Apple's App Store. The results included 135 items. The group was then filtered for those—as of the time of this report—with 25 or more reviews and also an average rating of 4 or better out of 5 stars. That resulted in the top five tools. In alphabetical order, they are: Daily Time Tracking, DayMap, GoodTask 3, Things 3, and Trello. Each solution—listed in alphabetical order—is highlighted next. •	Short description: Helps employees and freelancers create accurate time sheets without the hassle of using timers. •	Short description: A new way to organize your projects and tasks by visually mapping your life, one week at a time. DayMap allows you to see your projects, tasks, and schedule in an intuitive and user friendly interface. •	Short description: GoodTask 3 is a task manager based on Apple's stock Reminders and Calendars. With rich functions added top on Apple's Reminders and Calendars, you'll reach a whole new level of productivity with GoodTask 3. •	Short description: Things is the award-winning personal task manager that helps you achieve your goals. •	Short description: Trello’s boards, lists, and cards enable you to organize and prioritize your projects in a fun, flexible and rewarding way. This has been a quick review of tools for iOS. A future article will cover products for other platforms.